A grand tourer is a luxury high-performance sports automobile and Brillier's Chronograph Grand Master Tourer is an expression of the same. Ace in style, comfort and reliability, it too is a luxury sports watch. 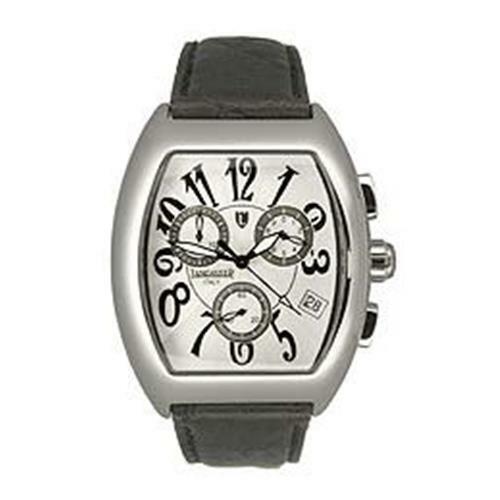 An enduring and long lasting time machine, it is driven by a powerful and accurate Swiss chronograph movement. Designed for the suave sporty globe trotter, it is an accessory that makes a bold statement of stature in line with the finest automobiles of our time. The 46 mm stainless steel case is retrofitted with a diamond studded bezel that has semblance to a high performance steering wheel. The 9 and 3 positions on the bezel are encrusted with sparkling diamonds and are a standard feature on all models. The chronograph function is coordinated in the rich dial by red hands that are easy to read, and the sporty white dial is retrofitted with blued markers and hands exemplifying the highest form of watch marking art. The steel case and band ingots are finished in two tone polished steel and rose gold. The comfortable water resistant poly urethane band is applied to matching case and dial colors in choice of white dial.